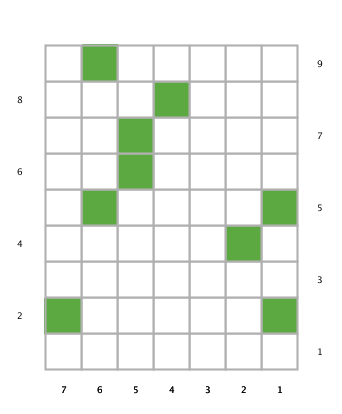 There are several ways to turn a short sequence of numbers into a grid that can be turned into a stitch pattern chart. I’m going to demonstrate the ones I can think of. 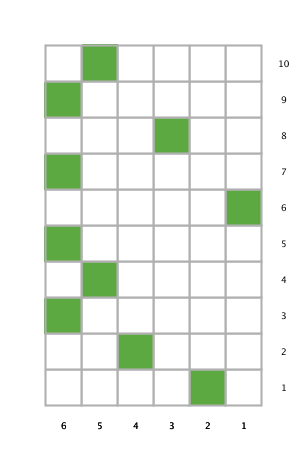 Once I’ve generated some grids, I’ll explain how to convert them into knitting charts. The word that I’m going to use for my examples is peace. Working my way across my table for encrypting letters as numbers, I get the following possibilities: 1605010305, 1705010305, 2005010305, 2205010305, 2405010305, and 8069656769. (You’ll note that since most of the letters are smaller than 6, they’re identical in most of the variations.) The Dewey Decimal number for peace is 303.66. Watch out for those zeroes! Keep in mind the difference between inspiration and encoding: if you’re going to make a secret code with a friend, you’ll need to always use the same method of choosing numbers, never omit zeros, and always use the same layout method. If you’re using meaning as a springboard for design that doesn’t need to be decipherable, you can be more flexible. If you have multiple meanings you want to incorporate, you can sometimes make a pattern that puts one meaning per row of the grid. Here, for example, is a grid of the Dewey Decimal numbers for peace (303.66) and knitting (746.432). Peace is the first row; knitting the second. I counted from right to left for both rows, and decided to count ten for the zero. If I wanted to, I could make the knitting line slightly shorter than the peace line; this can be accommodated with increases and decreases. If the difference in repeat length had been drastic, I would try repeating the shorter set of numbers again. As it is, I just filled in with a couple of blank spaces. If you treat the number of the base you’re using as one axis of the grid you’re filling, and the number of digits you’re encoding as the other, there’s some more variations possible. I’m going to show peace in both base 10 (the one we usually deal with in everyday math) and in base 6. The letters in peace converted into base 10 are 1605010305; converted into base 6, they’re 2405010305. There’s ten digits regardless. I have chosen to leave in the zeroes. In the base ten grid, I’m putting them in the tenth square; in the base six grid, in the sixth. Here is the base ten grid. I’ve started in the bottom right corner again (though really it’s arbitrary). 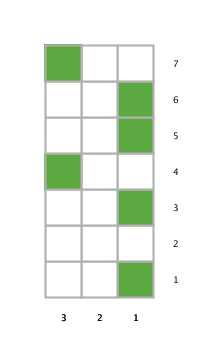 For this grid, I’m counting which digit it is from right to left, and then plotting the value of the digit vertically. So the first stitch is in the first row, the second in the sixth, the third in the tenth, and so on. Here is the base six grid. I’ve started in the bottom right corner again (though really it’s arbitrary). Zero is marked in the sixth column. For this grid, I’m counting which digit it is from bottom to top, and then plotting the value of the digit horizontally. So the first stitch is in the second column, the second in the fourth, the third in the sixth, and so on. A method of laying out a grid which can result in denser stitch patterns involves a little basic arithmetic (addition and division). Take the individual digits of the number you’ve come up with and add them together. Then see if you can divide it evenly; if not, we’ll pretend it’s the next number up that isn’t prime. 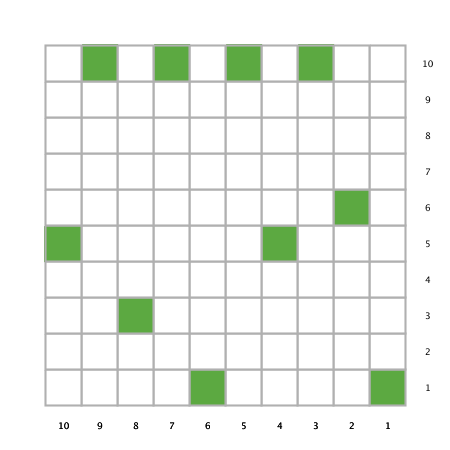 If the grid uses the exact number of squares, the last stitch marked will be in a corner; if you skip to the next number, the final corner will be empty. For this section, I’m going to pretend I don’t have any zeros. The digits from 1605010305 add up to 21, which is 3×7. The digits from 1705010305 add up to 22 (2×11); from 2005010305, 16 (4×4); from 2205010305, 18 (3×6); from 2405010305, 20 (2×10); from 8069656769, 62 (2×31. That would make a very long and skinny stitch pattern; we could pretend it’s 63, which is 7×9). I’m not going to show grids for all of these; it would take too much space. For the first grid, I worked my way back and forth as if knitting flat. For this one, I used the ASCII numbers. I started in the bottom right, counted 8, then counted 6, then 9 and so on. Each time I got to the end of a row, I turned around and continued the count on the next row. You will note that since my grid didn’t have the exact number of squares that there’s a blank square left over at the end. In the second, I did all my counting from right to left. If I couldn’t fit all the stitches on a row, I continued the count on the next. Each of these grids has possibilities for being turned into a stitch pattern, and you can see them knit up in swatches in later posts.